You are here: Home / Department Publications / BioSciences Master Reviews / Iron supplementation in nutritional programs: pathophysiological basis and correlations with health in developing countries. Master BioSciences, Département de Biologie, École Normale Supérieure de Lyon. Center for Global Health and Economic Development, The Earth Institute, Columbia University, New York, NY, USA. Iron deficiency is a serious pathology for iron metabolism and regulation have a crucial role in health. A litany of proteins are involved in iron uptake from the diet and in its availability for cell metabolism and erythropoiesis. The immune system interacts with iron metabolism in order to fight infections and the lack of iron is responsible for numerous diseases. Therefore, we report here the different outcomes of exogenous iron treatments in developing countries on iron deficiency anemia, stunting, the immune system and malaria. Iron intake was shown to compensate some effects of its irregular natural availability but it could turn out to be harmful as well. Iron mysteries remain to be discovered in association with other essential micronutrients. Iron is one of the most widely existing element and an essential micronutrient for the human body. Two different iron forms exist: the dominant insoluble oxidized Fe3+ form and the soluble reduced Fe2+ form. As an electron donor and acceptor, iron is implicated in electron transport which leads to energy production in the respiratory chain. The fluctuation between these two forms enables the nutrient to be free in the cells or linked to several proteins: heme proteins such as hemoglobin, myoglobin or cytochromes and non-heme proteins as iron-sulfur proteins and enzymes. They are implicated in respiration, energy metabolism and DNA synthesis but new functions are being discovered which are linked to immunity and host defense against pathogens ●●. In industrialized countries, it is usually stated that the organism contains approximately 50 mg iron/kg . As most iron is recycled from erythrocytes, iron circulation is often considered a closed circuit. The sole exogenous source of iron is the 1-2 mg/day absorbed from the diet. It corresponds to the daily loss of iron ●●. That's why iron quantity depends on the diet. Iron is found as heme iron in animal products and as non‑heme iron in beans and lentils. Both are assimilated by dynamic dietary processes and iron homeostasis is then closely regulated by several mechanisms in the body. Nevertheless, even if the diet is well-balanced, only 10 to 20% of ingested iron is finally absorbed and bioavailable . Around 65% is then used as hemoglobin compound in erythrocytes, 25% is stored in the liver, the spleen and the bone marrow, 8% is part of myoglobin in muscles and less than 2% is left for enzymes, cytochromes and transport ●●. As such crucial functions depend on iron, iron deficiency (ID) is one of the most serious nutritional diseases in the world. In developing countries, it is a consequence of poverty: a long-term lack of nutritious food, an inadequate intake or an inadequate care, diseases, infections and blood loss by menstruation for women are as many factors which have to be taken into account to explain ID . Its importance as a public health problem is based on the seriousness of its outcomes on health. It affects mainly children and pregnant women for the fetus and placenta need a lot of iron. The disease leads to other troubles such as iron deficiency anemia (IDA), malaria and stunting, a disease characterized by a limited body size, result of a growth defect. In 2009, one fifth of maternal deaths was due to IDA in the world ●. Nutritional research programs study the influence of iron intake on these troubles to improve nutrition and health. Here we report the molecular mechanisms of iron intake which are implicated in ID, the different iron treatments which are used to fight IDA and stunting and finally we investigate the role of iron in immunity and its implication in malaria in developing countries. Iron metabolism begins with ingestion and uptake. Directly after ingestion, the absorption takes place on the enterocytes brush border which stands for the gate to load iron. Indeed, the cells are a physical barrier between the gut and the blood which restricts the influx of iron into the circulation and allows a regulated uptake. In the body, the electronical state of iron is important for health. When iron is free in cells or in the plasma, Fe2+ catalyses the conversion of hydrogen peroxide into free radicals. They contribute to DNA, membranes and proteins damage and ultimately cell death. In physiological conditions, this is regulated by the binding of iron to proteins. It still enables cells to use it but limits its availability ●●. Redox reactions also regulate the balance between Fe2+ and Fe3+. Their are catalyzed by duodenal cytochrome b-like ferrireductase (DcytB) on the apical membrane of enterocytes and by the ferroxidase hephaestine on the basal membrane. The divalent metal transporter 1 (DMT1) carries non‑heme iron through the apical membrane of enterocytes in the cytosol. Heme carrier protein 1 (HCP1) uptakes cellular heme iron. Iron is bound to apoferritin in the cytosol to form ferritin, a ubiquitous storage protein but which is mainly found in liver and spleen. It can store up to 4,500 Fe3+ atoms ●●. If not stored, iron is released in the body by ferroportin (FPN) (Figure 1). On enterocytes and macrophages membranes, it is the only known cellular efflux protein. It determines iron circulatory concentration by a set-point. The concentration is very low under physiological conditions but can be enhanced when iron becomes deficient. Iron then binds to transferrin (Tf) in the blood ●●. Iron absorption is the most important regulation of iron homeostasis: all the steps are regulated according to the body needs. In pathological conditions, iron metabolism is strongly influenced by inflammation and clinically leads to anemia. In the plasma, Tf can bind two Fe3+ atoms at the same time with high affinity ●●. The whole iron-Tf complexes are up-taken by cells through receptor-mediated endocytosis onto Tf receptors 1 and 2 (TfR). In acidified low-density vesicles, TfR enhances the dissociation of iron from Tf . It is translocated into the cytosol to ferritin by DMT1 and Tf is returned to the extracellular medium (Figure 1). Iron in cells is then used for metabolism, energy production, cell proliferation and myoglobin production in muscles ●●. Iron can also be linked to lactoferrin (LF), a protein of the transferrin family. It is an iron chelator which is mainly found in maternal milk and relays iron to infants. However, iron highest requirement is red blood cells production in the bone marrow. Tf appears to be the only source of iron for erythroid cells. DMT1 delivers iron to erythroid progenitors. Its expression at cellular membranes or phagosomal membranes is regulated and not only influences iron movement to the circulation but also adjusts the heme biosynthetic pathway to the body needs ●●. The machinery is an integral part of the pathway. In functional red blood cells, iron then ensures its function as an oxygen carrier. Linked to the heme of hemoglobin, its redox state allows the establishment of a reversible iron-oxygen bond on a specific binding site. Erythrocytes load up, transport and deliver oxygen from the lungs to the cells through the blood. After their 120-day-lifespan, aged erythrocytes are endocyted by macrophages by erythrophagocytosis. Iron is then recycled out of the phagosome by DMT1 while the heme is eliminated. Iron binds to Tf again to start a new cycle in the circulation ●● (Figure 1). Figure 1. Iron uptake, transport, delivery and recycling in the human body. Iron uptake, transport, delivery and recycling in the human body. Iron is uptaken by DMT1 into enterocytes, stored by ferritin and released when necessary by ferroportin FPN to the blood. Regulated transport mechanisms imply heme, lactoferrin LF, transferrin Tf and several iron-linked proteins. Circulating iron is uptaken by needing cells thanks to TfR and used for erythropoiesis, cell metabolism and production of myoglobin reserves in muscular cells. Iron is recycled in macrophages and released again by DMT1 and FPN. Iron homeostasis can be impaired leading to the activation of various regulation pathways. They modulate the two main iron releases: from enterocytes and from erythrocytes. Regulations of serum iron begin with different sensors. TfR expression at cells membrane indicates iron handling in the serum by sensing iron-Tf complexes . In addition to iron electronical toxicity, iron overload quickly becomes toxic too. Indeed, the human body does not possess any real mechanism for iron excretion for it is usually only crucial to store iron. The exclusive way to decrease iron handling is to limit gut absorption. The mechanism includes the Human hemochromatosis protein HFE, a surface protein which binds to TfR1 so it regulates iron uptake ●. Then, in the case of iron overload, when iron-Tf complexes are too many, they displace HFE to TfR2. This new complex triggers the post-transcriptional up-regulation of hepcidin. It is a small hormone which is the key regulator of iron homeostasis, produced by the liver and controlling plasmatic iron balance. It binds to FPN to induce its internalization and lysosomal degradation and like this, decreases iron absorption and corrects iron overload ●●. However, this situation is extreme and occurs only with genetic diseases like hemochromatosis. Important diet variations are not enough to come to such a level of deregulation. In the inverse case of iron deficiency, several regulations tend to maintain physiological iron content. First, intestinal absorption is increased by the same HFE-hepcidin-FPN axis. When iron is scarce, it decreases hepcidin expression which increases FPN secretion and activity and this way creates a regulatory system ●●. Iron intracellular homeostasis is regulated too. The post-transcriptional regulatory system iron responsive element IRE- iron regulatory protein IRP modifies gene expression in enterocytes. When iron supply is low, IRP has a high affinity for mRNAs. IRP binds for example to the 5' untranslated region of ferritin mRNA, inhibiting translation, and to the 3' untranslated regions of TfR1, DMT1 and FPN, stabilizing the nucleic acids and enhancing their translation. Thus, iron storage is limited and free iron is delivered. When iron is in excess, the binding of IRPs with Fe-S clusters inactivates its high affinity for mRNAs, leading to iron storage . Iron metabolism underlies the vast majority of iron linked diseases. For example, carrying oxygen to muscles and brain thanks to erythrocytes is necessary for motor, cognitive and physical development. That's why research is conducted in developing countries to try to better understand potential correlations between ID and stunting. In developing countries, the main groups affected by ID are infants (0-4,99 years), children (5-14,99) and pregnant women ●. Thus, iron treatments take a lot of different forms, doses and frequencies which vary with the population affected. First, supplementation describes the way oral iron is given to individuals within a form directly available for absorption called elemental iron. Iron supplements are ferrous sulfate and more scarcely ferrous fumarate but take lots of different forms (Table 1). During pregnancy, women are often anemic because iron needs are drastically increased. Iron is given to them as iron folate for 90 days, usually during the first term (Table 1) . This may affect the fetus as a form of prenatal iron supplementation. For infants, supplementation is efficient but instead of giving them extra iron, the nutritional scientific community is know convinced that breastfeeding is the most efficient natural way to give an infant the quantity of biologically available iron he/she needs (Table 1) . Different doses of supplementation are possible: low iron formulas, approximately 10 mg iron/day, or high iron formulas, 100 to 200 mg ●. Researchers are looking for the lowest adequate dose to use for prevention. Giving exogenous iron to iron sufficient children might indeed lead to an iron overload which was here-above described as toxic. Moreover, daily or intermittent doses, once or twice a week, are possible. For example, complementary food should increase in frequency as the baby grows: 2–3 times per day at 6-8 months and 3-4 times per day at 9-24 months . Table 1. The different iron treatments mostly used in developing countries. The different iron treatments mostly used in developing countries. Fortification is a specially fortified complementary food. It dwells on adding iron to food to increase food overall nutritional content. Home-fortification is widely used: small iron packets for one serving are distributed to be added to wheat flour or maize flour, but also to cereals, rice, sugar, oil, biscuits, sauces, porridges, legumes or milk ●. In this food, iron is water-soluble, ferrous sulfate, or non-water-soluble, ascorbic acid or ferrous fumarate or ferric pyrophosphate. It is a food-based approach which aims at being easily replicated by local communities by the use of local foods. Some studies showed that fortification, especially with sodium iron edetic acid NaFeEDTA, was more efficient than supplementation . Programs start giving priority to iron fortification vs supplementation. Indeed, supplementation may have a larger impact on health but fortification is cheaper. Thus, it appears to be more cost effective and economically more attractive than supplementation . Anemia is characterized by an abnormal low level of red blood cells or hemoglobin molecules. Features are depletion of iron stores, then decreased transport and finally impaired erythrocytes production (dyserythropoiesis) and increased destruction of erythrocytes ●. The primary and best-known cause is severe iron deficiency (ID): 50% of anemias are iron deficiency type of anemia (IDA) ●. Other causes are hemoglobinopathies, other micronutrient deficiencies or infections (malaria, tuberculosis, HIV...) and heavy blood loss. Anemia increases the risk of maternal and child mortality, decreases cognitive and physical development in children ●. Indicating poor nutrition and poor health, anemia can be fought on these two fields. 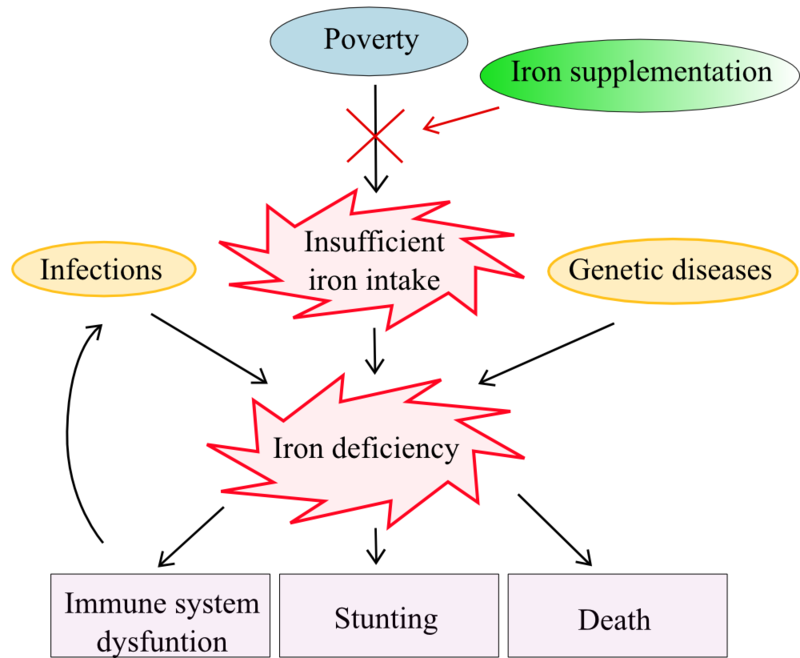 To analyze the effect of iron on IDA, iron was given to individuals and IDA prevalence was analyzed. Most of anthropometric data come from double blind trials. They are collected without knowing if the patient has been given a fortified treatment or not. Iron content was assessed by hematological outcomes. Serum ferritin level is the best criteria but serum iron and hemoglobin levels are two important symptoms too ●. The individual is considered anemic when the hemoglobin concentration is under 11 g/L . It is quantified with photometric methods. But iron indicators do not provide enough information and they often have to be used with other data, most of the time clinical outcomes like mortality and morbidity. IDA is first studied during pregnancy for it affects between 50% and 70% of pregnant women in the developing world . Outcomes are evaluated in both women and newborns. Oral iron supplementation increases mean hemoglobin and serum ferritin levels in a significant way compared with placebo women. Thus, it provides a lower risk to be anemic at four, eight and twelve weeks for pregnant women . Iron treatment can be completed with folic acid or vitamin A to improve hemoglobin levels even more (Table 1) . Some bovine lactoferrin has been tested too and has the same positive effects (Table 1) . Indeed, these molecules help to upload iron. Besides, it was shown that daily intake has better hematological results than doses once or twice a week . High iron doses do not fiercely improve anemia: for example 600 mg and 1200 mg iron treatments show no significant difference ●. Current “low-iron” formulas are the subject of actual controversy. They may pose some risks of ID but have fewer side effects ●. The second group studied is children. Iron supplementation and fortification reduce IDA  Electrolytic iron, ferrous sulfate or ferrous fumarate were recently revealed as equally effective. For example, weekly and twice-weekly iron therapy with 5 mg ferrous sulfate/kg effectively corrected IDA in 2- to 6-year-old children. Hemoglobin, mean corpuscular volume and serum ferritin had normal values in response to iron treatment . In a whole, iron intake decreases anemia by correcting hemoglobin and erythrocytes levels and by refilling the body iron stores. A possible explanation is the recovery of a normal iron content which re-triggers erythropoiesis. IDA is the first manifestation of ID in children but stunting is one of the most visible. Also called chronic malnutrition, it is a form of growth failure and occurs over time, unlike acute malnutrition. A child who is stunted is normally proportioned but shorter than what is expected for his/her age (height-for-age z score < -2). 178 million of children under 5 years were stunted in 2005 . Half of stunting is determined in utero . It is the result of a very significant lack of food combined with inadequate feeding practices, poor food quality or frequent infections . Iron treatment might help to limit stunting during infancy, especially between 0 and 3 years old when growth is rapid. Tanzanian infants who were given iron-enriched food were significantly taller than the control children . But iron supplementation could turned out to be healthy only when children are stunted and anemic. Those with already normal hemoglobin rates may be affected by negative effects on growth, for example a diminution of length and head circumference . Thus, ID correlates with stunting but other causes like vitamin A, iodine and zinc might be involved too. Children development is adversely affected by the lack of food too. Prenatal iron folate supplementation is important for the central nervous system development . Iron intake prevents a delayed development and an inadequate growth later during childhood. Some results show an improvement of mental development scores in children above 7 years who were previously anemic ●. Iron supply appears to improve physical growth, intellectual and motor functions, learning ability and work performance. However, development troubles always have long-term impacts and such impairments can not be totally undone. With several iron therapies conducted on Costa Rican infants, it has been revealed that iron might just lead to a significant reduction in anemia prevalence correlated with persistent lower mental and motor test scores . Even with therapies resulting into a total extinction of hematological anemic markers, troubles remained . IDA in infancy can not be reversed, even 10 years after an iron therapy . Thereby, iron treatments are various and adapted to the population studied. They help preventing IDA but are not the main factor: starvation and poverty are responsible for development troubles. Iron only improves overall health. Iron metabolism proteins are involved in immunity (Table 2). Thus, ID damages the immune system. It induces a reduced bactericidal activity by leukocytes but not of phagocytosis, a lower concentration of cells mediating adaptative immunity like natural killers and lower interleukin-2 levels . Thus, maintaining iron content seems crucial for immunity. For instance, iron appears to be required for neutrophils development in the bone marrow. Their bactericidal activity might be reestablished after a 15-day iron treatment . Table 2. Metabolic and immunological functions of major proteins involved in iron regulation. Metabolic and immunological functions of major proteins involved in iron regulation. Iron status can have a significant impact on infectious diseases and conversely. Bacteria and Protozoa have either receptors to human Tf, lactoferrin LF or hemoglobin, either and more frequently, produce siderophores which bind to Tf iron in the host circulation ●. The complex iron-siderophore is then reabsorbed by the pathogen for its metabolism and this consequently decreases the iron amount available for the host. The host has complex defense mechanisms which are activated during inflammation. There are two main ways to defend the organism against pathogens regarding iron: starve them from iron or overload them with iron in phagosomes which produces ROS and kills them. During the inflammatory response, TLR4 is the major receptor for lipopolysaccharide LPS. TLR4 pathway influences the translation of the Tumour Necrosis Factor TNFα and IL-6 mRNAs, leading to cytokine biosynthesis by immune cells (Figure 2) ●●. Pro-inflammatory cytokines then switches on the hepcidin-iron axis pathway in the liver leading to regulations of gene expression. Ferritin synthesis is increased and withhold iron. Release by FPN and uptake by Tf are inhibited (Figure 2) ●●. Thus, iron is sequestrated in cells leading to nutritional stress, hypoferremia and a reduction of pathogenic growth afterwards . Besides, the host produces LF and siderocalin, a siderophore chelator, which deprive infective organisms of iron. It is also a direct attack against iron acquisition by the pathogen ●●. One last mechanism to protect the host from pathogens is to inhibit intracellular pathogen growth. In macrophages, DMT1 and FPN have the ability to enrich the immediate phagosomal microenvironment of the pathogen with iron to kill it by ROS production. Then the same proteins recycle iron (Figure 2). Figure 2. Iron regulation during inflammation. Pathogens (in green) produce siderophores to chelate host iron. The host replies with various immunological mechanisms leading to serum iron starvation or iron overload in phagosomes. Lactoferrin (in orange) and siderocalin (in light brown) inhibit iron use by the pathogen. Coordinating these pathways results into hypoferremia and pathogenes' decline. Consequently, iron supplementation was tested for its potential repair of the immune system breakdown. It was sometimes correlated with a reduction of morbidity from infectious diseases but studies are often in interference with treatments against these infections. One of the main disease studied for iron immunal function is malaria. Plasmodium falciparum invade erythrocytes and destroy them. The bursting process leads to low reticulocytes counts and triggers the production of high levels of pro-inflammatory cytokines. Cytokines like TNF then depress erythropoiesis in the bone marrow and stimulate erythrophagocytosis. Thus, hemolysis leads to the loss of iron and malaria has been linked with severe anemia in African children. The organism lacks iron and thus has higher serum TfR concentrations . Research is based on the fact that the treatment of IDA could result in the prevention of malaria itself. Nutrition anthropometric data from Tanzania where malaria is endemic showed that iron treatment improved hematologic status and could be carried out without adverse consequences. However, iron did not significantly affect parasite density or rate, neither did it affect the levels of anti-malarial IgG . Only ID was corrected by hematological recovery and the infection was still present. Indeed, malaria should first be cleared with an effective antimalarial drug. The persistence of anemia after the drug treatment should then be treated with iron . These data resulting from nutritional research are currently highly controversial. Several clinical trials start to point out the absence of health enhancement and even some putative deleterious effects of exogenous iron intake. In children, iron aggravates malariometric indices like severe parasitemia, fever or splenomegaly rates (enlargement of the spleen) . In Somali nomads, episodes of infection were more frequent with iron treatment than in the placebo group . This difference suggests that host defense is better during ID than during iron repletion and iron intake impairs here innate defenses. ID may be also part of an ecological compromise, permitting optimum co-survival of host and infecting agent . In a whole, iron improves overall nutritional status and immunity. It results in fewer deaths due to malaria but does not ameliorate malaria prevalence. It is recommended that nutrition programs should be integrated into existing malaria intervention programs ●●. Stopping iron supplementation in deficient populations is, therefore, not currently indicated. The quality of human life is determined very early on by nutrition. Micronutrients like iron are the key to development and diseases protection. Iron is the central micronutrient in the vicious circle malaria-IDA-immunity (Figure 3) and spatial correlations between these troubles can be drawn. Thus, the lack of iron or an inappropriate iron absorption leads to people suffering lifelong hardship (Figure 3). Iron can be given as a treatment, for IDA, or as prevention, for diseases and overall health recovery. Furthermore, the current debate about the impact of iron on malaria prevalence shows that iron supplementation and fortification programs can only be set in community settings with specific situational contexts. Figure 3. Causes and outcomes of ID and IDA in relation to nutritional programs. Causes and outcomes of ID and IDA in relation to nutritional programs. agronomical and economical field works, and above all, access to food. Multi-scale interventions are clearly needed and research will need to be accentuated to understand which treatments have the best benefit-to-cost impact and which interventions must be privileged. Economic argument is crucial in nutritional programs. I thank Nathalie Alazard for her help and advices concerning this review. ●● This review hightlights all the molecular mechanisms which are involved in iron metabolism, from absorption, storage, transport, cellular uptake and degradation, to regulation pathways and iron role in heath. 3. Cherayil BJ: The role of iron in the immune response to bacterial infection . Immunol. Res. 2011, 50 :1–9. 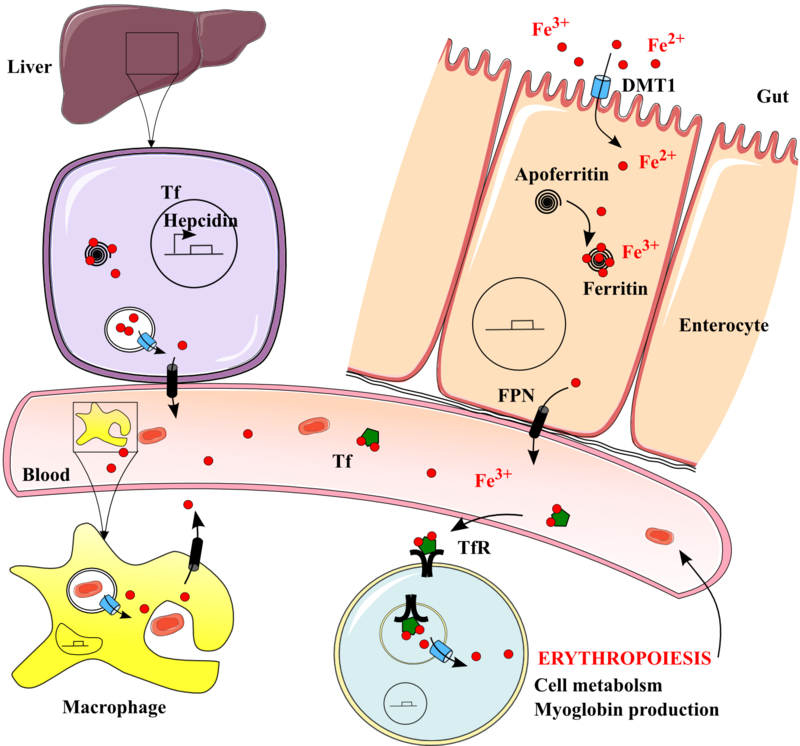 ●● Iron intracellular and extracellular homeostasis regulations are explained in details and authors dwell especially on the role of ferroportin in these pathways. Hfe and TLR4 functions in the inflammatory response and in iron sequestration are outlined. 5. WHO | Infant and young child feeding: A tool for assessing national practices, policies and programmes [Internet] . WHO 2003. 6. FFI, USAID, GAIN, WHO, The World Bank, UNICEF: Investing in the Future: A United Call to Action on Vitamin and Mineral Deficiencies [Internet] . 2009. ● The report shares the role of several micronutrients in health and the different treatments which are set in order to overcome the corresponding deficiencies in developing countries. 7. Latunde-Dada GO: Iron metabolism: microbes, mouse, and man . BioEssays 2009, 31 :1309–1317. ●● This paper summarizes iron metabolism and enlightens the importance of several metabolic proteins as the arms to cross barriers in the competition for iron between host and pathogen. 9. WHO | Iron deficiency anaemia: assessment, prevention and control [Internet] . WHO 2001. 10. Weiss G: Modification of iron regulation by the inflammatory response . Best Pract. Res. Clin. Haematol. 2005, 18 :183–201. ● Interactions between iron and the immune system are introduced. Modulation of immunity and secretion of acute phase proteins and cytokines decrease iron release. 12. WHO | Worldwide prevalence of anaemia 1993-2005 [Internet] . WHO 2008. ● Anemia is defined as a public health problem with its prevalence, estimation factors and groups affected in the population. ● This article tries to better understand the different doses used in iron-fortified formulas given to children. It is part of the controversy on low and high iron formulas. 18. Reveiz L, Gyte G, Cuervo L, Casasbuenas A: Treatments for iron-deficiency anaemia in pregnancy [Internet] . John Wiley Sons 2012, 367 . ● Analysis of the different routes of iron administration in women, their doses and frequences, their efficiency to clear anemia and their outcomes on mortality and morbidity. 24. Black RE, Allen LH, Bhutta ZA, Caulfield LE, De Onis M, Ezzati M, Mathers C, Rivera J: Maternal and child undernutrition: global and regional exposures and health consequences . The lancet 2008, 371 :243–260. 25. Publications - Save the Children: State of the World's Mothers 2012: Nutrition in the First 1,000 Days [Internet] . 2012. 28. Christian P, Murray-Kolb LE, Khatry SK, Katz J, Schaefer BA, Cole PM, LeClerq SC, Tielsch JM: Prenatal micronutrient supplementation and intellectual and motor function in early school-aged children in Nepal . JAMA J. Am. Med. Assoc. 2010, 304 :2716–2723. ● This systematic review identifies various interventions and studies their impact on development in children. It enhances the controversy of iron potential benefits on mental and intelligence tests scores. 34. Weinberg ED: Iron availability and infection . Biochim. Biophys. Acta BBA-Gen. Subj. 2009, 1790 :600–605. 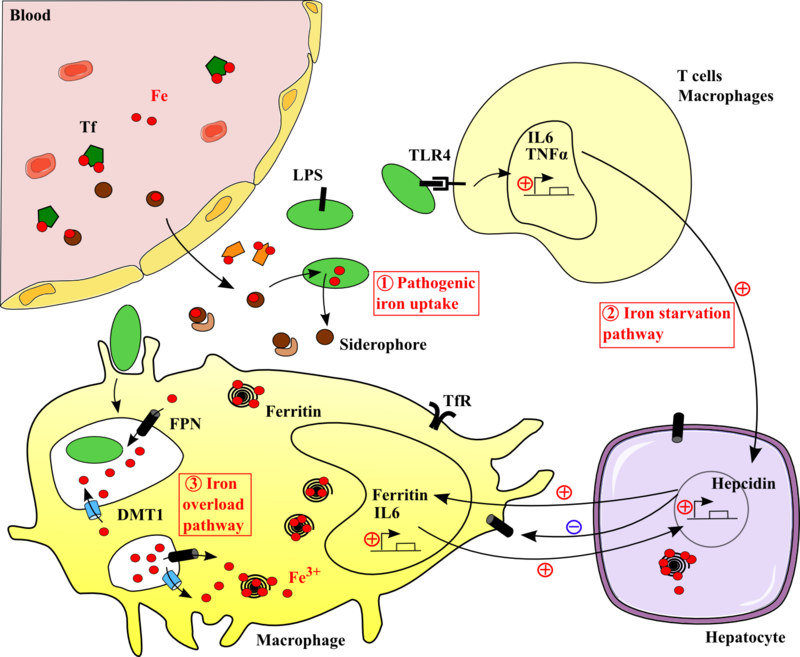 ● An other review which explains pathogenic iron acquisition, its constitutive components and processes and the host response to them. ●● This paper enters in the mess of the polemic about malignant iron supplementation in malaria endemic areas. It suggests to secure disease-nutrient interactions research with health programs and monitoring.